An exercise for Patellofemoral joint pain / knee pain Hi, guys, I’m Loulou, one of the physiotherapists here at 4Lane. If you have any knee pain or have pain especially when you’re squatting, we want to strengthen up through your legs and knees and we want to do that in a way that isn’t painful. 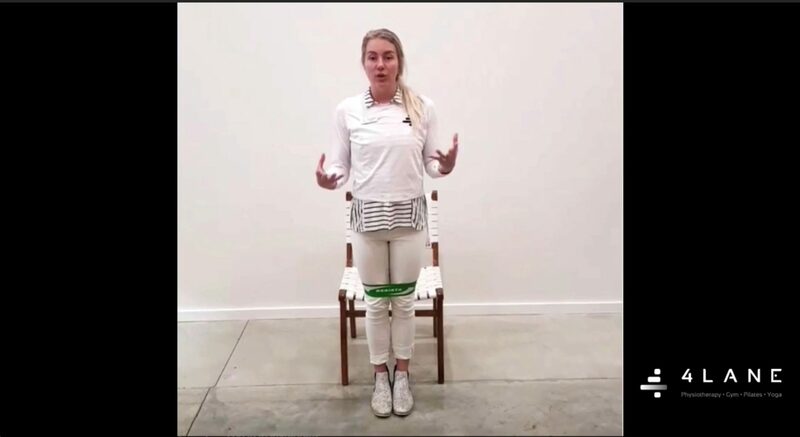 So one of the ways you can do that is if you have a band, tie it around your legs otherwise your going to think about actively drawing your knees away. What that does is activates through your hips and bottom and can change the force of how you move through your knee. So take your knees away from one another… another good thing you can do is stick your bottom out so you’re hinging at your hip, which reduces the amount of bearing you have on your knees, then stand up. So you might do 8-12, have a rest and do three sets.